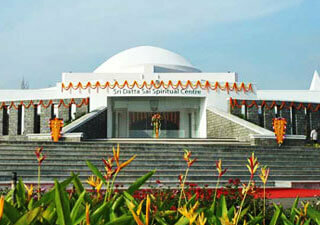 Spread over an area of two acres, the Sri Datta Sai Spiritual Centre (SDSSC) is located in Southern Bangalore, 45 kilometres from city centre. This is the biggest Shirdi Sai temple in the South of Bangalore. On the 29th October 2012 in the auspicious Dhanur Lagna Puskaramsa, the Pratisthapana homa was performed as statues of Sri Dattatreya and Sri Shirdi Sai Baba were installed. The 5.5 feet tall Sai Idol is carved out of a single block of Australian marble. Prior to its installation the idol sought the blessings of Sai Baba; it was placed before Sai in Shirdi and sanctified. SDSSC is built in the form of a Mandala (Circle) that establishes a balance of visual elements, symbolizing unity and harmony. The vibrant interiors held on the roof by conical pyramids induce positive energy and hence, one can experience peace, tranquillity and complete surrender to the almighty.